Playing with Stencils, originally uploaded by Amy Rice. 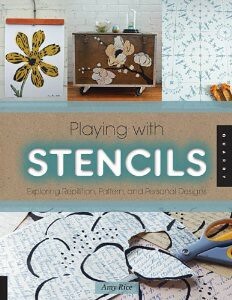 Playing with Stencils is a how-to book that aims to teach the reader a new art-making technique. Unlike other stencil books that furnish already made templates and a single idea of what to stencil it on, this book encourages the readers to create their own stencils by teaching. Simple instructions for how-to create a stencil combined with ambitious projects for inspiration makes this book unique. You can pre-order your copy now, it will be in stores in May. I can wait to get your book in my hands! Congratulations! Oh that IS exciting news!! Congratulations Amy!! It is sure to be a good one.